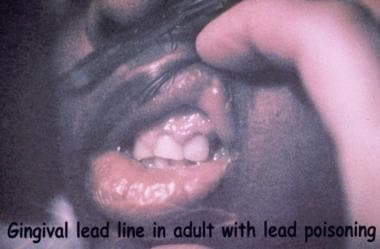 Lead line on the gingival border of an adult with lead poisoning. Wrist-drop in adult with lead poisoning and renal failure. It is vital to diagnose and treat other family members or friends with similar lead exposure. It should be noted that lead can be transmitted from a mother to her child via breast milk. Lead toxicity or encephalopathy should be suspected in patients presenting with afebrile seizures. However, lumbar puncture performed on patients with lead encephalopathy and increased intracranial pressure can precipitate cerebral herniation and death. Consultation with a clinical toxicologist or a physician conversant with treating lead poisoning is beneficial. Consultations with a hematologist and a nephrologist may be helpful. The local poison control center may provide useful information to facilitate treatment and follow-up. Obtain laboratory work (see the first image below) and imaging studies (see the second and third images below) without delay. 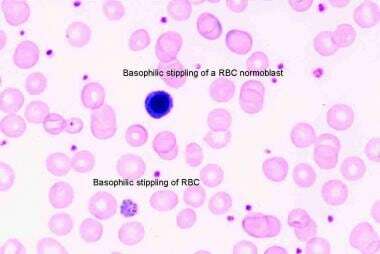 Peripheral smear taken from an 8-year-old Pakistani girl who presented with an acute hemolytic anemia and a lead level of 125 mcg/dL. 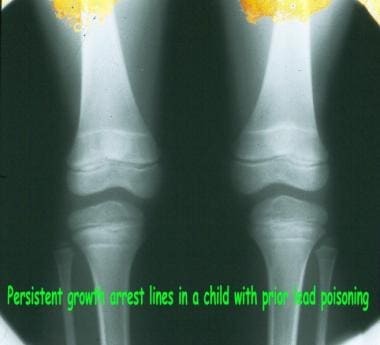 Growth arrest lines, also known as lead lines, in bones of a child who recovered from lead poisoning. 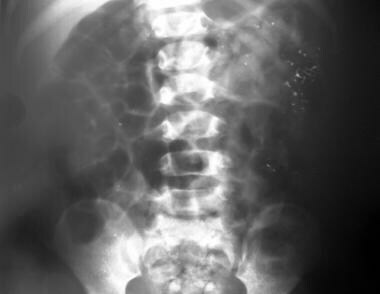 Abdominal flat plate showing multiple radio-opaque foreign bodies including paint chips and an earring. In adults who have not been exposed to lead, BLLs should be ≤25 µg/dL. Individuals with chronic workplace exposure to lead may have higher blood lead levels. Lower birth weight has been reported in children born to mothers with BLLs of 10–19 µg/dL, and BLLs of 20-39 µg/dl are associated with spontaneous abortion. Individuals may also develop nonspecific abdominal colic symptoms, decreased libido, fatigue, and mood swings at this BLL range. Treatment of lead poisoning consists of separating the child from the source of lead exposure. Children and their families should be referred to the local public health office for further investigation and identification of the source of lead exposure. Chelation is used only when separation fails to drop the lead fast enough or far enough or when the lead level is in the potentially encephalopathogenic range (>60 μg/dL). If the patient is comatose or seizing, the airway must be protected. Aside from initial workup and treatment, immediate transportation to a hospital with experienced personnel and facilities for treating patients with lead poisoning is imperative. Begin an intravenous (IV) drip of normal saline. Patients who do not have severe poisoning or in whom the diagnosis is unclear can be treated symptomatically while laboratory work results are pending. Patients who have lead levels below the range that is considered potentially encephalopathogenic (ie, < 60 μg/dL) and who can successfully be kept away from further lead exposure can probably be treated on an outpatient basis. Symptomatic pregnant patients with elevated lead levels should be treated with chelation in consultation with and under the supervision of a medical toxicologist. Treatment of asymptomatic pregnant patients with elevated lead levels should not be initiated without consultation with a medical toxicologist. Only very limited data are available on the teratogenicity of chelation therapy. Therefore, antioxidants, which although have not been shown to enhance the effect of chelators, may have a role in helping restore antioxidant activity and thus mitigate some symptoms and signs. Since most recommended antioxidants are considered safe, the use of them adjunctive to chelation or at levels of lead below those at which chelation would be indicated, may be beneficial. Two parenteral and two oral chelators for lead exist. Dimercaprol, also known as BAL (British antilewisite), is the prototype chelator. A bisulfide molecule, this lipid-soluble drug must be administered intramuscularly (IM). It has the typical sulfide odor, and patients often complain of the taste and bad feeling when they receive the drug. Calcium disodium edetate (CaNa2 EDTA) may be administered IM or intravenously (IV); in many centers, the IM route has been abandoned in favor of a continuous IV drip that appears to provide improved outcome and decreased adverse effects. Some controversy exists regarding the use of parenteral CaNa2 EDTA and the possible increase in brain lead in the first 24 hours of therapy. [20, 21, 22] Chisolm, in his classic article describing chelation therapy for children with symptomatic lead poisoning, reported that children often deteriorated during the early stages of treatment and postulated that this deterioration was due to shifts in lead subsequent to the use of CaNa2 EDTA. Accordingly, he suggested combined therapy with both BAL and EDTA. No significant studies have been undertaken to allow any evidence-based decision on whether this approach is warranted. The author is aware of at least 3 patients whose clinical course deteriorated during the first three days of therapy with CaNa2 EDTA chelation and in whom severe hyponatremia and elevated vasopressin levels were found. Thus, use of combined therapy for the first few days to prevent such deterioration may be prudent. The two oral chelators currently used in the United States are D-penicillamine and succimer. Although the US Food and Drug Administration (FDA) approved succimer for use in children with lead levels higher than 45 μg/dL, D-penicillamine has not yet been approved, despite its widespread use for the past 2 decades. Because lead impacts gastrointestinal (GI) motility, the use of an oral chelator in patients with significantly increased lead levels (eg, >60 μg/dL) seems counterintuitive and has not been studied for efficacy. Some controversy exists regarding the use of chelation while the patient has ongoing exposure, either to external lead sources or to lead possibly present in the GI tract. [24, 25, 26] Although it has long been the dogma that chelation should not be delayed to empty the intestines, just how to chelate in such a circumstance has not been subjected to scientific investigation. The controversy regarding possible redistribution of lead to brain during EDTA therapy adds to this conundrum. Another chelator, 2,3-dimercaptopropane-1-sulfonic acid sodium salt (DMPS), is available in Europe for both oral and parenteral use. It has not been approved or licensed in the United States, but it has been used in various forms in alternative medicine clinics. Careful attention to renal and hepatic function is important during the administration of chelation therapy. Fluid and electrolyte levels must be monitored carefully because fluid shifts may occur during therapy. Reports from the 1960s have documented cases of children whose condition deteriorated after the initiation of chelation therapy. Several children have been reported to develop the syndrome of inappropriate secretion of antidiuretic hormone (SIADH) shortly after beginning chelation therapy. All patients must have careful follow-up at weekly intervals to watch for unexpected reexposure or reequilibration of lead from bony stores after discontinuance of chelation. International Programme on Chemical Safety: Ten chemical of major public health concern. World Health Organization. Available at http://www.who.int/ipcs/assessment/public_health/chemicals_phc/en/ . 2017; Accessed: October 17, 2017. World Health Organization. Exposure to Lead: A Major Public Health Concern. Available at http://www.who.int/ipcs/features/lead.pdf?ua=1 . 2010; Accessed: October 17, 2017. Occupational Safety and Health Administration. Lead. United States Department of Labor. Available at https://www.osha.gov/SLTC/lead/. Accessed: October 17, 2017. Mason LH, Harp JP, Han DY. Pb neurotoxicity: neuropsychological effects of lead toxicity. Biomed Res Int. 2014. 2014:840547. [Medline]. [Full Text]. Agency for Toxic Substances and Disease Registry. Toxicological Profile for Lead. U.S. Department of Health and Human Services. Available at https://www.atsdr.cdc.gov/toxprofiles/tp13.pdf . August 2007; Accessed: October 17, 2017. Kim HC, Jang TW, Chae HJ, Choi WJ, Ha MN, Ye BJ, et al. Evaluation and management of lead exposure. Ann Occup Environ Med. 2015. 27:30. [Medline]. [Full Text]. Hauptman M, Woolf AD. Lead Poisoning and Children in Foster Care: Diagnosis and Management Challenges. Clin Pediatr (Phila). 2017 Sep 1. 9922817734364. [Medline]. Grasso IA, Blattner MR, Short T, Downs JW. Severe Systemic Lead Toxicity Resulting From Extra-Articular Retained Shrapnel Presenting as Jaundice and Hepatitis: A Case Report and Review of the Literature. Mil Med. 2017 Mar. 182 (3):e1843-e1848. [Medline]. Bustamante ND, Macias-Konstantopoulos WL. Retained Lumbar Bullet: A Case Report of Chronic Lead Toxicity and Review of the Literature. J Emerg Med. 2016 Jul. 51 (1):45-9. [Medline]. Macedo G, Lopes S, Peixoto A. Misleading Gastrointestinal Symptoms: The Ongoing Story of Chronic Lead Intoxication. J Clin Gastroenterol. 2015 Nov 26. [Medline]. Gonulalan U, Hayirli A, Kosan M, Ozkan O, Yilmaz H. Erectile dysfunction and depression in patients with chronic lead poisoning. Andrologia. 2012 Nov 1. 1-5. [Medline]. [Full Text]. Rebelo FM, Caldas ED. Arsenic, lead, mercury and cadmium: Toxicity, levels in breast milk and the risks for breastfed infants. Environ Res. 2016 Nov. 151:671-688. [Medline]. Association of Occupational and Environmental Clinics. 31. Association of Occupational and Environmental Clinics. (2013). Medical Management Guidelines for Lead Exposed Adults. Retrieved. Available at http://www.aoec.org/documents/positions/mmg_revision_with_cste_2013.pdf. 2013; Accessed: October 17, 2017. [Guideline] Lead exposure in children: prevention, detection, and management. Pediatrics. 2005 Oct. 116(4):1036-46. [Medline]. [Full Text]. [Guideline] Interpreting and managing blood lead levels < 10 microg/dL in children and reducing childhood exposures to lead: recommendations of CDC''s Advisory Committee on Childhood Lead Poisoning Prevention. MMWR Recomm Rep. 2007 Nov 2. 56:1-16. [Medline]. [Full Text]. [Guideline] Schnur J, John RM. Childhood lead poisoning and the new Centers for Disease Control and Prevention guidelines for lead exposure. J Am Assoc Nurse Pract. 2014 May. 26 (5):238-47. [Medline]. [Full Text]. [Guideline] U.S. Preventive Services Task Force (USPSTF). Rockville (MD): Agency for Healthcare Research and Quality (AHRQ). Screening for elevated blood lead levels in children and pregnant women: recommendation statement. 2006 Dec 12. [Full Text]. Flora Gagan, Gupta Deepesh, Tiwari A. Toxicity of lead: A review with recent updates. Interdisciplinary Toxicology. 2012; 5 10.2478/v10102-012-0009-2. 47-58. Kasperczyk A, Slowinska-Lozynska L, Dobrakowski M et al. The effect of lead-induced oxidative stress on blood viscosity and rheological properties of erythrocytes in lead poisoned humans. Clinical Hematology and Microcirculation. 2013. 10.3233/CH-131678. Cory-Slechta DA, Weiss B, Cox C. Mobilization and redistribution of lead over the course of calcium disodium ethylenediamine tetraacetate chelation therapy. J Pharmacol Exp ther. 1987. 243:804-13. [Medline]. Seaton CL, Lasman J, Smith DR. The effects of CaNa(2)EDTA on brain lead mobilization in rodents determined using a stable lead isotope tracer. Toxicol Appl Pharmacol. 1999 Sep 15. 159(3):153-60. [Medline]. Sanchez-Fructuoso AI, Cano M, Arroyo M, Fernandez C, Prats D, Barrientos A. Lead mobilization during calcium disodium ethylenediaminetetraacetate chelation therapy in treatment of chronic lead poisoning. Am J Kidney Dis. 2002 Jul. 40(1):51-8. [Medline]. Chisolm JJ Jr. The use of chelating agents in the treatment of acute and chronic lead intoxication in childhood. J Pediatr. 1968 Jul. 73(1):1-38. [Medline]. Smith DR, Markowitz ME, Crick J, Rosen JF, Flegal AR. The effects of succimer on the absorption of lead in adults determined by using the stable isotope 204Pb. Environ Res. 1994 Oct. 67(1):39-53. [Medline]. Cremin JD Jr, Luck ML, Laughlin NK, Smith DR. Oral succimer decreases the gastrointestinal absorption of lead in juvenile monkeys. Environ Health Perspect. 2001 Jun. 109(6):613-9. [Medline]. Varnai VM, Piasek M, Blanusa M, Saric MM, Kostial K. Succimer treatment during ongoing lead exposure reduces tissue lead in suckling rats. J Appl Toxicol. 2001 Sep-Oct. 21(5):415-6. [Medline]. Chisolm JJ Jr. Evaluation of the potential role of chelation therapy in treatment of low to moderate lead exposures. Environ Health Perspect. 1990 Nov. 89:67-74. [Medline]. Cremin JD Jr, Luck ML, Laughlin NK, Smith DR. Efficacy of succimer chelation for reducing brain lead in a primate model of human lead exposure. Toxicol Appl Pharmacol. 1999 Dec 15. 161(3):283-93. [Medline]. Flora SJ, Pande M, Mehta A. Beneficial effect of combined administration of some naturally occurring antioxidants (vitamins) and thiol chelators in the treatment of chronic lead intoxication. Chem Biol Interact. 2003 Jun 15. 145(3):267-80. [Medline]. Varnai VM, Piasek M, Blanusa M, Juresa D, Saric M, Kostial K. Ascorbic acid supplementation does not improve efficacy of meso-dimercaptosuccinic acid treatment in lead-exposed suckling rats. Pharmacol Toxicol. 2003 Oct. 93(4):180-5. [Medline]. Thomas DJ, Chisolm J Jr. Lead, zinc and copper decorporation during calcium disodium ethylenediamine tetraacetate treatment of lead-poisoned children. J Pharmacol Exp Ther. 1986 Dec. 239(3):829-35. [Medline].